Shan Dong Finer Lifting Tools co., LTD can provide customized service of lifting up jack as required. FINER claw jack can be used on lift via the top or the claw part. Hydraulic jack is also a capacity index, the heavy lifting weight should be in the hydraulic jack capacity. 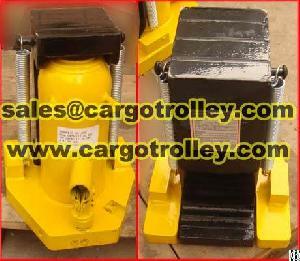 Lifting toe jack are used to make it easier for large machines to get off the ground. Lifting moving jack have low maintenance cost and high reliability. Our company provides good after-sales service. For more information regarding hydraulic toe jack applications, toe jack discount price, lifting moving jack manual instruction, please kindly feel free contact us. Professionally service hope will get your satisfaction.